Companies who want to increase profits will find few places that can yield more in terms of cost savings and customer satisfaction than their distribution center, order fulfillment systems, shipping areas, or warehouses. Proper distribution center operations hinge on physical layout & material flow, the right equipment, intelligent processes, safe & productive employees, and accurate information. Making these facilities dynamic and efficient should be a key business objective for any organization that depends on their DC as a way to satisfy customers. The range of solutions goes beyond what most manufacturers can offer within the narrow confines of their product lines. That's why an integrator like Cisco-Eagle can play such an important and vital role in the creation of better distribution systems. Inaccurate, slow picking processes cannot be tolerated: What creates the best flow of products through the system? We believe that the solution is different in every case. Is it picked quickly? Accurately? At the right time? There are solutions that work for every situation. It's a matter of selecting the right one. Coping with the consequences of an Inefficient Warehouse Design. Cisco-Eagle provides warehousing and storage solutions that increase operational efficiency. Suffering from Limited Space Constraints. Significant space gains are made by using the right storage equipment and the right layout. Hurt by Poor Inventory Accuracy. The right storage solution dramatically increases inventory accuracy. Hampered by Poor Order Picking Productivity. 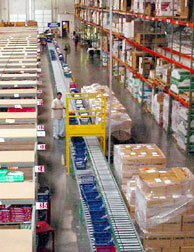 The ability to quickly and accurately pick orders is a key to distribution success. With too many Picking Errors. Errors begin with process, layout, and equipment and end with people. Errors are systematic, and your system should actively reduce them. Committing too many Shipping Errors. Minimizing erroneous shipments is vital in any business, but especially for distributors. Shipping errors lead to returns, lost hours, compromised product, and unhappy customers. Shipping systems that regulate errors are the surest way to reduce them. Burdened by Excessive Labor Costs. More efficient use of space, time, and processes can reduce the amount of labor required.